General interest day Camps are offered weekly throughout the summer for multiple age groups. There are many themes to choose from and most camps include at least 1 hour of pool time each day. 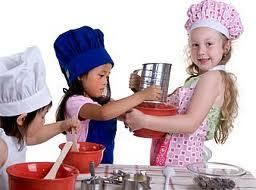 Most camps also include arts & crafts, a sports activity and outdoor games. Kids will play outside, participate in arts and crafts, and participate in activities related to the camp’s weekly theme! Offered throughout the summer, we have many themes to choose from. Sprouts camps do not include swimming. Have fun playing a variety of sports throughout the week including tennis, racquetball, squash, soccer, and more! Get swinging with beginner aerial yoga and dance! Discover what toes have to do with tennis and how feet affect football. 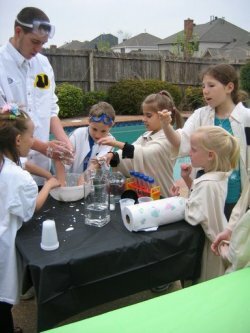 “Mad scientists” will test their lung capacity, crash eggs, and even launch rockets! Provided by Mad Science of Greater Tampa Bay. Explore the science behind green living and learn how to help our planet. Acid rain, global warming, pollution and recycling are just some of the topics your child will explore with plenty of hands on activities. Provided by Mad Science of Greater Tampa Bay. This camp has a tasty twist! Spend a portion of each day in a professional kitchen preparing delicious, healthy meals and learning why fitness is 80% nutrition. In addition, campers will participate in daily activities and swimming. Get groovy with this summer camp. That 70’s Camp! Campers will play games, learn dance moves, and do arts and crafts – all with a throw-back theme! 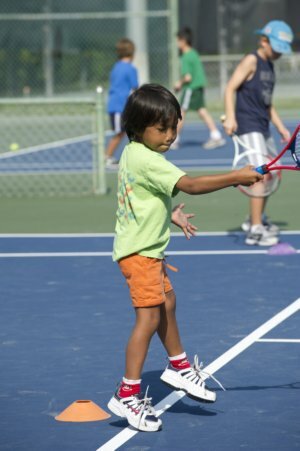 Tennis summer camps are offered for all skill levels, with professional instruction for beginners to tournament level players! Bath and Racquet Athletic Club is consistently voted the best tennis club in Sarasota and offers the most courts, best coaches and excellent facilities for your summer tennis camp experience. Quickstart, Beginner, Advanced and Tournament level camps are offered for all 10 weeks of the summer. Learn CPR, Jr. lifeguard skills and earn your babysitting certification during this informative, fun, weeklong camp! Junior “divers” will snorkel, use SCUBA gear to breathe underwater, and learn SCUBA safety. Campers can purchase a mask and snorkel at Florida Underwater Sports for a reduced rate. Fins provided. Provided by Florida Underwater Sports. Become a certified SCUBA diver in just five days! Start with classroom and pool sessions and then, on the final two days, dive off the shore of one of Sarasota’s beautiful beaches. Mask, fins, and snorkel can be purchased at Florida Underwater Sports for a reduced rate. Provided by Florida Underwater Sports. Spend the week in the pool enjoying the beautiful summer weather! Learn water safety, swim strokes, and play plenty of fun water games.